If you're interested: Please get in touch with Christoph Hennersperger, such that we can give you a more detailed overview of the project, and also show you our lab environment and running projects at our chair. Medical ultrasound (US) is already used today as the primary modality of choice for many clinical indications. Robotic ultrasound systems could potentially provide an automation of current ultrasound acquisitions, which would be especially helpful for interventional and screening applications. While the feasibility of automatized ultrasound imaging systems was shown by various research groups up to now, the application of ultrasound gel still needs to be performed manually today. This project focuses on ultrasound coupling and aims at overcoming this issue based on developments in other research areas to allow for automatic robotic ultrasound acquisitions. Exploration and evaluation of alternatives to acoustic coupling with medical ultrasound gel (e.g. research in other ultrasound applications). Development of a prototype for automatic gel coupling either by automatic gel application, or by developing an alternative method. Interested students should have good knowledge in C++. Basic knowledge in ultrasound imaging and GPU programming is beneficial. The project is located both in the interdisciplinary research laboratory at Klinikum rechts der Isar (http://campar.in.tum.de/Chair/IFL), as well as at the Chair for Computer Aided Medical Procedures in Garching. Interested students will be immersed in our collaborative team working on ultrasound imaging, and the focus of the work can be adjusted to the specific scientific interests of the student. Navab, Nassir, Christoph Hennersperger, Benjamin Frisch, Bernhard Fuerst. "Personalized, Relevance-based Multimodal Robotic Imaging and Augmented Reality for Computer Assisted Interventions." Medical Image Analysis (2016). Esposito, Marco, et al. "Cooperative robotic gamma imaging: enhancing us-guided needle biopsy." International Conference on Medical Image Computing and Computer-Assisted Intervention. Springer International Publishing, 2015. Abstract: Medical ultrasound (US) is already used today as the primary modality of choice for many clinical indications. Robotic ultrasound systems could potentially provide an automation of current ultrasound acquisitions, which would be especially helpful for interventional and screening applications. While the feasibility of automatized ultrasound imaging systems was shown by various research groups up to now, the application of ultrasound gel still needs to be performed manually today. 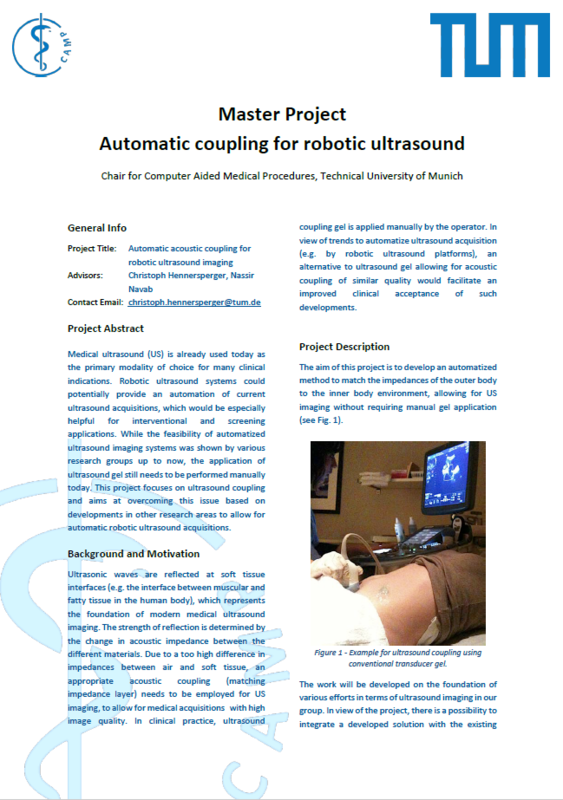 This project focuses on ultrasound coupling and aims at overcoming this issue based on developments in other research areas to allow for automatic robotic ultrasound acquisitions.